Our nation’s economy is now two years into a shaky recovery following the Great Recession of 2007–2009, yet for the millions of Americans still out of work, the recovery is largely meaningless. All Americans saw significant job losses during the Great Recession and comparatively high unemployment rates persist for all population groups—none more so than African Americans. The unemployment rates for African Americans by gender, education, and age are much higher today than those of whites, and these unemployment rates for African Americans rose much faster than those for comparable groups of whites during and after the Great Recession. The unemployment rates for many black groups in fact continued to rise during the economic recovery while they started to drop for whites. The first few months of 2011 saw substantial employment gains for African Americans but job growth stalled yet again in the past few months. It is now painfully clear that African Americans are still facing depression-like unemployment levels. Policymakers should obviously address the overarching problem of unemployment in whatever plan comes together to raise the federal debt limit by August 2, but there are unique structural obstacles that prevent African Americans from fully benefiting from economic and labor market growth—obstacles that deserve particular attention when unemployment rates for African Americans stand at the highest levels since 1984. This issue brief details these high unemployment rates and explores the reasons for them, including particular weaknesses in sectors that offer disproportionate employment opportunities for African Americans, long unemployment spells, and the recurring “first fired, last hired” phenomenon among African Americans that plagues our nation’s workforce practices. We suggest a few needed short-term remedies. Most immediately, we suggest an overhaul of the unemployment insurance system to address this problem alongside more job creation and job training programs aimed at different groups of African Americans. Most recently, the black unemployment rate averaged 16.1 percent in April, May, and June 2011, compared to an average of 7.9 percent for whites in the same period. That is, the African American unemployment rate two years into the recovery was more than twice as high as the white unemployment rate. This was also true at the start of the Great Recession in the fourth quarter of 2007, when the black unemployment rate averaged 8.4 percent but the white unemployment rate stood at only 4 percent. The gap between black and white unemployment rates also widened during the Great Recession and the ensuing weak labor market recovery. The unemployment rate for African Americans rose by 7.7 percentage points from the fourth quarter of 2007 to the second quarter of 2011, compared to an increase of only 3.9 percentage points for whites during the same period. The gap in unemployment rates between African Americans and whites persists across a wide range of population groups. We observe stark differences in the labor market experiences of African Americans and whites even if we account for gender, education, and age. The unemployment rate among black women, for instance, was 14.1 percent in the second quarter of 2011 compared to 7.4 percent among white women. Similarly, the unemployment rate among black men was a staggering 18.3 percent over that same period while the unemployment rate among white men was 8.3 percent. The differences in the total unemployment rates between African Americans and whites can also not be attributed to differences in educational attainment. Black unemployment is significantly higher than that of whites at all levels of educational attainment. The unemployment rate of African Americans without a high school diploma was 26 percent in the second quarter of 2011, compared to 12 percent for whites without a high school diploma. The unemployment rate among African Americans with high school diplomas and no postsecondary education was 15.9 percent, while that of similarly situated whites was 8.4 percent. Finally, the unemployment rate of African American college graduates was 6.9 percent, while the unemployment rate among white college graduates was a mere 3.9 percent. The differences in unemployment rates between African Americans and whites also hold across age groups. When employment prospects dry up, it becomes increasingly difficult for young people in particular to find employment, with many pushed out of the labor force. And once again, the unemployment rate of black youth was an astronomical 41.3 percent in the second quarter of 2011 compared to a still very high 22.3 percent for white youth. Similarly, the unemployment rate for African Americans in the prime working ages of 35 to 44 stood at 12.6 percent in the second quarter of 2011, compared to only 6.5 percent for whites in this age group. And the unemployment rate among African Americans aged 65 and older was 9.4 percent, while the unemployment rate of whites in this age group was only 5.9 percent. The upshot: There are structural barriers to employment in the labor market affecting African Americans alone—obstacles that impede the advancement of African Americans. So let’s turn to the evidence pointing to what those barriers might be. The existence of these barriers is evident in the changes in unemployment rates across all subgroups of Americans. 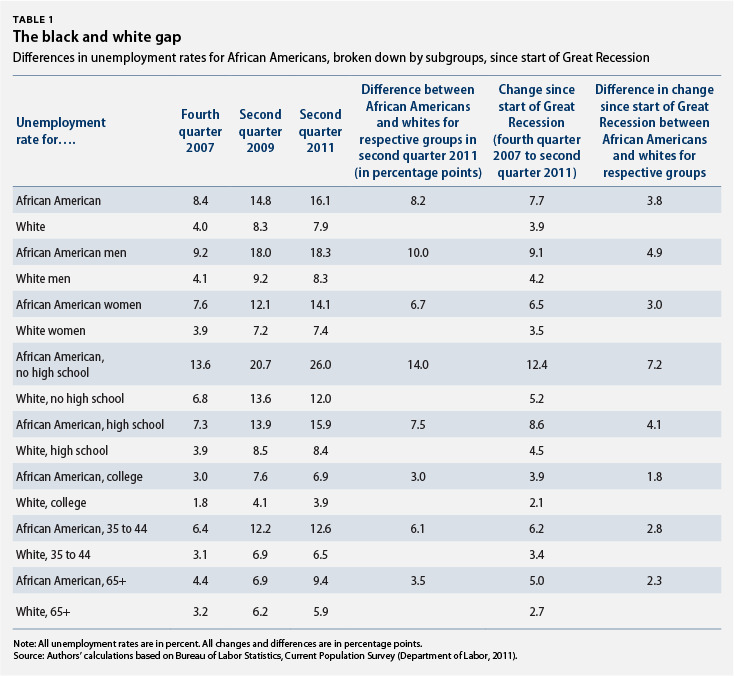 Table 1 shows that the unemployment rate of African Americans increased substantially faster than that of whites, regardless of breakdowns by gender, education, and age, since the start of the Great Recession. Indeed, the relationship between unemployment levels among African Americans and whites often held steady over this period—to the extent that the unemployment rates for African Americans remained at twice the level of the white unemployment rate even as the white unemployment rate sharply increased. Why would this happen? The unemployment data over the past three recessions illustrate two telling trends. First, the unemployment rate among African Americans rises faster than that of whites during a recession. Second, the unemployment rates for African Americans tend to start to rise earlier than those of whites—and those rates tend to stay higher for longer than those of whites. This phenomenon can be described as “first fired, last hired” and is one of the key structural obstacles facing African Americans in the labor market. We look first at data from the Great Recession and its aftermath to illustrate this point. The recession began in December 2007 and ended in June 2009. Over that period the unemployment rate for African Americans increased by 6.4 percentage points while the unemployment rate among whites only increased by 4.3 percentage points. Once the economic recovery was underway, beginning in the third quarter of 2009, the white employment rate began falling in March 2010 while the black unemployment rate has not yet begun to decline. The same holds true in the previous recession, which began in the first quarter of 2001 and ended in the third quarter of 2001. The unemployment rate of African Americans stayed elevated for a longer period of time, increasing a full percentage point, compared to half a percentage point increase in the unemployment rate of whites. And after the recession ended, black unemployment began to fall in the third quarter of 2003 while the unemployment rate of whites began to decline in the first quarter of 2003. We observe a similar difference in the recession of the early 1990s. This recession started in the third quarter of 1990 and ended in the first quarter of 1991. The white unemployment rate peaked at 7.2 percent in the first quarter of 1992, one year after the recession officially ended, which makes this recovery the first jobless recovery. The black unemployment rate peaked at 14.7 percent in the second quarter of 1992. So how will the current economic recovery play out for African Americans seeking employment? The data in Table 1 further underscore this phenomenon of labor market pain lingering longer for African Americans. The unemployment rate was lower for only one African American group—those with a college degree—in the second quarter of 2011 than at the start of the recovery in the second quarter of 2009. But the white unemployment rate had dropped for six out of seven subgroups—white women being the exception—during that same period. The unemployment rate among whites is still unacceptably high two years into the recovery but at least it’s starting to move in the right direction, which is more than we can say for African Americans. Policymakers need to learn from this telling evidence that black labor market prospects are hit much harder by recessions and that it takes longer for African Americans to recover from an economic downturn. The evidence is clear and so, too, are the obstacles. One structural obstacle is the result of the industries and sectors in which African Americans typically find employment. The manufacturing sector, which employs a large number of African American men, experienced steady job losses throughout the Great Recession—even though jobs are returning to this sector in the wake of the recovery. Manufacturing added 164,000 jobs between November 2010 and April 2011 but grew by only 6,000 jobs in June after shedding 2,000 jobs in May. And the workweek in manufacturing fell by 0.3 hours in June 2011, which suggests that employers can still ramp up production by increasing hours again and not hiring more people. This is not good news for African Americans given the first fired, last hired phenomenon they face in the workplace. Furthermore, as state and local governments continue to cut spending, African Americans are disproportionately affected by the losses in those areas. State and local governments lost a total of 25,000 jobs in June 2011 alone, and since the recovery began in July 2009, state and local governments have shed more than 500,000 jobs. The fact that the job losses in states and local governments continued while private-sector hiring started up again in part explains the difference in unemployment trends between whites and African Americans. Job losses continued in a sector that typically offers disproportionate opportunities for African Americans. Another structural obstacle: More people lose jobs and possibly stay out of a job longer in groups with higher unemployment rates, thus suffering from a longer loss of jobrelevant skills and hence creating a vicious cycle of high unemployment. Discrimination may pose another structural obstacle. A 2011 Economic Policy Institute study concludes that labor market discrimination is at the root of black male underemployment. The study analyzes employment data and determines that occupational preferences and a dearth of “soft skills” are not the causes of employment disparities between blacks and whites. By systematically excluding those other causes, EPI concludes that discrimination must exist in today’s job market. This is a common approach among economists to determine if discrimination exists: Eliminate all other possible causes and any remaining differences in employment between African Americans and whites are the result of discrimination. We use a similar yet much less sophisticated approach in our analysis presented in Table 1. We control for possible factors that could explain unemployment differences, such as educational attainment, gender, and age. African Americans still see higher unemployment rates and sharper increases in unemployment rates after we control for these factors, indicating that discrimination could be part of the explanation in addition to other structural obstacles already discussed. Other structural obstacles may include the lack of relevant social networks for African Americans compared to whites, lack of public transit options to get to a job, and lack of savings to enable moving somewhere else to look for or take a new job. This is by no means an exhaustive list of the potential obstacles to full labor market participation for African Americans but the data show that African Americans need immediate attention to their employment struggles as persistently high unemployment rates take a toll on employees and their families. A good place to start may be to consider adjusting the unemployment insurance system to make it more inclusive of African Americans. Part of the purpose of the unemployment insurance system is to replace some of the wages lost by those who are involuntarily employed, funneling money into the economy and sustaining economic demand. That demand is what fuels hiring. Unfortunately, African Americans are more likely to hold low-wage jobs or engage in seasonal employment and are thus less likely to be eligible for unemployment insurance. In 2009 African Americans were underrepresented among unemployment insurance recipients in almost half of the states with available data. One of the ways to adjust the unemployment insurance system to make it more comprehensive is to extend the number of weeks that unemployed workers can claim benefits during tough economic times. This doesn’t address the issue of unemployment insurance ineligibility but by extending coverage for those eligible, the result is more money flowing into the economy, enabling unemployed African Americans and others to actively seek employment, thereby cultivating an atmosphere that spurs job creation. Another response to the persistently high unemployment rate among all groups, but especially among African Americans, should be a continued emphasis on job training and job creation programs. One such program, AmeriCorps, can create 57,000 jobs in fiscal year 2012 for young people. With almost 50 percent of black youth currently out of work, investing in AmeriCorps and other national service programs would undoubtedly have a positive effect. In addition, advancing a green jobs agenda can create accessible and high-quality jobs in the construction sector, where African Americans are typically underrepresented. The Department of Labor supports programs that help ex-offenders transition back into society and find steady employment. 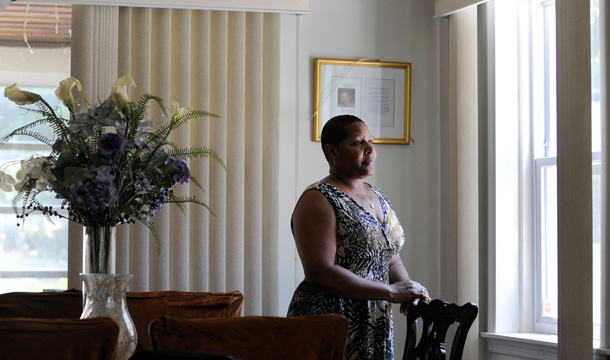 Such programs helped more than 10,000 African Americans in 2009. Continuing to support those programs can lower the African American unemployment rate. Finally, the Department of Justice, Office of Federal Contract Compliance Programs, and the Equal Employment Opportunity Commission all should vigorously enforce policies that prevent labor market discrimination. Labor market discrimination has become less prevalent over time but remains a persistent problem, especially along racial lines. These are merely small steps to help address massive long-term structural obstacles to the full participation of African Americans in our nation’s labor force. Policymakers need to undertake larger steps to address the persistent gap in the labor market experience of African Americans and whites, among them more educational opportunities and closing the wide racial wealth gap. African American workers and their families can ill afford the economic and human pain that high and long spells of unemployment bring with them. Christian E. Weller is a Senior Fellow at Center for American Progress and an Associate Professor, Department of Public Policy and Public Affairs, at the University of Massachusetts Boston and Jaryn Fields is a Special Assistant at the Center for American Progress.